Google Latitude is a stripped down version of Dodgeball. This gives us an indication of what we might see next from the service - a better way to get in touch with friends we've added. This, in turn, gives us more reason to add friends. The screen grab you can see here is what the iGoogle gadget currently looks like via Google.co.uk. This is a load of phish. Google Latitude works fine in the UK. Why am I given such a poor interface? Probably because I signed up via dot.com as many UKers do. 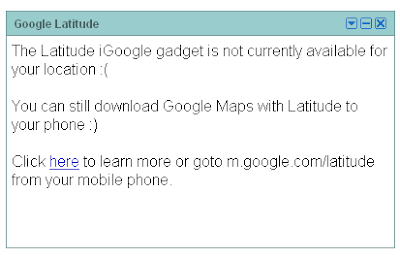 It's certainly worth noting that google Latitude launched as mobile software and as an iGoogle Gadget. There was no standalone website for the product. Imagine how different Orkut would have been if it launched after iGoogle and as an iGoogle gadget? This is an easy prediction; we'll see more services without a full website and only via gadget form. As a result the worth of everyone's iGoogle gadgets go up. I'm visiting my IG page a lot more now I've Latitude on it. The incentive I have as a marketer to get my clients IG gadget on your IG page is also now much higher. In the future Google Latitude has some hi-tech aspirations. It could be used to target people with whispering window ads or even the much rumoured Google billboard. Billboards actually make a lot of sense for Google a there (should be) are a lot of maths behind traffic flow, destinations and advert placement.